WHY WAS THE 20th CENTURY SO BLOODY? There have always been mad-men, but the 20th century was the bloodiest century in human history. Why? What changed? Why did the world suddenly find itself murdering millions of innocent people? Is it possible that one specific idea influenced or provided a justification for the atrocities we know as Nazi Germany, the eugenics movement and abortion? Is it possible that idea was Darwinian evolution? Charles Darwin loved his wife and children. He paid his taxes and he never kicked his dog. But Charles Darwin had a big idea, and ideas have consequences. Can we thank the advocates of natural selection for the deaths of millions of people? Or were their ideas twisted and misapplied? 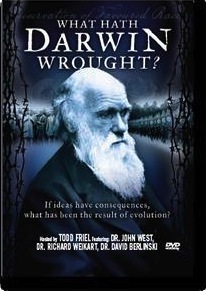 Dr. John West, Dr. Richard Weikart and Dr. David Berlinski present the evidence that seeks to resolve the question, “What hath Darwin wrought?” This DVD features the two hour television presentation and almost ninety minutes of bonus features. I really liked this video. It was hard hitting, but had plenty of evidence.